I’m proud to announce that Feasts of Strength now has a facebook page that will probably be under construction for the next month or so. You can follow me there too at www.facebook.com/feastsofstrength Yay to you for being an invested follower! For the last 3 years my boyfriend and I have been doing an annual fall hike up off highway 2. Its not particularly strenuous, but it does start out at 4500, and end up at around 5500. 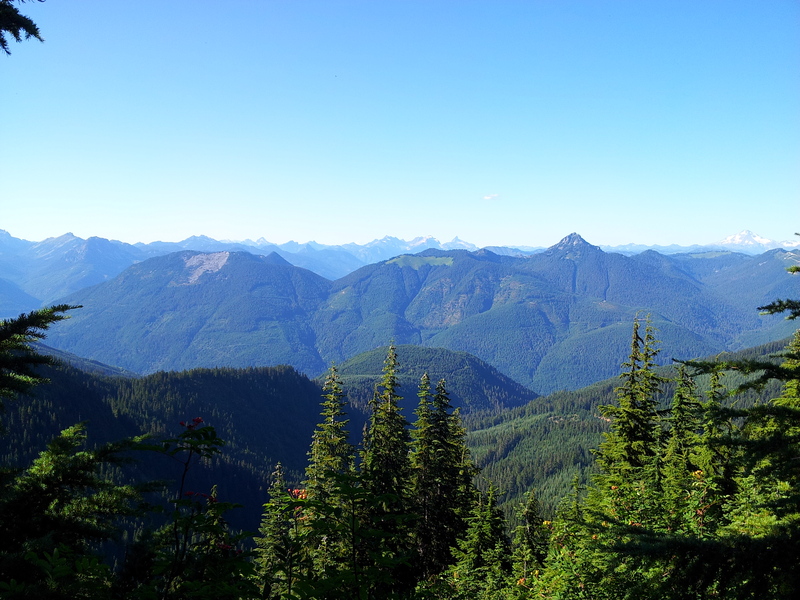 After a short uphill climb the rest of the hike is pretty much all sweeping views of the cascades. The best part about the hike is the berries. I’m sure you’ve had a blue berry before, and you may have had a huckleberry, but have you had the illusive wild blueberry. These delicious little bastards grow at high elevations. They look quite a bit like huckleberries, only instead of growing at knee to waist height, they are at ankle to shin height. The cold from the elevation make them quite a bit sweeter than their lowland counterparts, and they are so delicious you’d think they were fake. 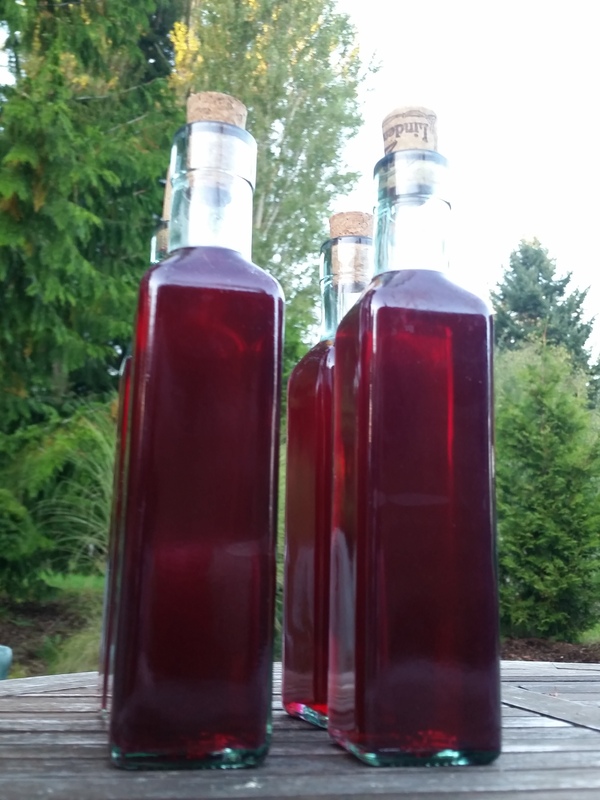 Every year, after picking I drop off a bag of blueberries with my mom, we celebrate the incoming blueberry liqueur by making shrimp sandwiches. These aren’t just any shrimp sandwiches, its layers of amazing. Shrimp strategically placed to have some in every bite, crammed between dungeness cream cheese spread, and a layer of guacamole. The whole thing is entirely too much to handle. I might warn you. Making this is a bit of an involved process. It usually take at least 30 minutes to put it all together. WORTH IT!!!! Coat the bottom of a large pan with olive oil, add in the lemon juice and the liquid smoke and swirl it around to mix. Toss in the shrimp, and add the chili powder, cayenne, salt, and pepper. Saute until the shrimp is cooked all the way through and set aside to cool. Strain the crab meat, and combine all of the ingredients until well mixed. Mash up the avocados until they are creamy, add in the rest of the ingredients until well mixed. You can buy it too, but it won’t taste as magical. On one side of the sandwich, place the crab dip. On the other put the guacamole. On crab side begin placing shrimp, interlocking them with one another so the entire piece of bread is covered in little shrimp bodies. 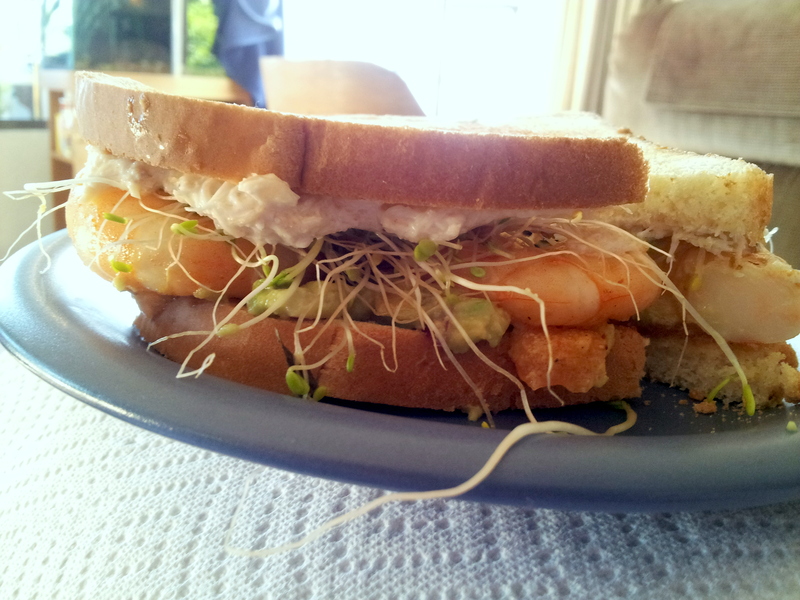 Top with alfalfa sprouts, and put the sandwich together. Mmmmmmh. Sandwichy goodness. I recommend pants with elastic bands. You’ll want 2 or 3 of these. That view!!! WOW! Simply gorgeous!!! If you are EVER in the Seattle area in the late summer, early fall, I encourage you to hike Tonga ridge. It is gorgeous for the entirety of the hike. I love it up there. I may just have to make a special trip just to see it!!! ah, you west coast people keeping all the Dungeness crab. 🙂 Damn near impossible to get here in PA, and it’s my favorite. Sandwich looks tasty. thanks for the like over on my blog. I’m amused to find you were in the Army. My husband was and was amused to let me sample MREs, especially the pink omelet thing. That experience surely would get you to cooking good things. Mre’s are quite nasty. But there are little things I miss, like jalapeño cheese spread. When I found out they sold them individually in the Internet my little heart skipped a beat. Lol and shame on him for giving you the omlette and not the chili mac! ah, he says in “his day” they didn’t have chili mac. But he says he did save me from eating the chicken a la king. which also came with evidently some horrific fruit cake.